Virginia Commonwealth University is the largest university in Virginia and a leader of research activity. The university is composed of two campuses: the Medical College of Virginia (MCV) located near downtown Richmond, and Monroe Park Campus located two miles west. The university retained Moseley Architects and Hastings & Chivetta for the expansion/renovation of the recreation centers on both campuses. Counsilman-Hunsaker was retained for aquatic design and engineering services for MCV’s new aquatic center. Salt/chlorine generation systems are utilized for the sanitation of all three pools. This eliminates the need to have chlorine delivered to the facility. Regenerative media filtration systems are also utilized to reduce the facility’s water usage. In May 2011, Counsilman-Hunsaker provided on-site aquatic operations training and consulting to assist the operators and managers in troubleshooting common pool problems and ensure the pools are being operating above industry standards. 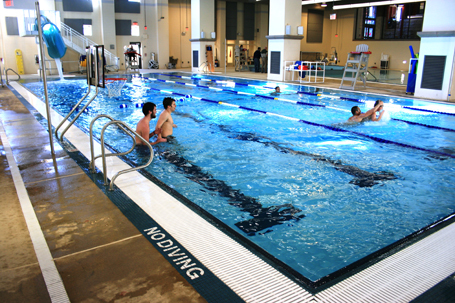 The Recreation Center received the U.S. Green Building Council’s Leadership in Energy and Environmental Design (LEED) Gold certification for energy efficient design.